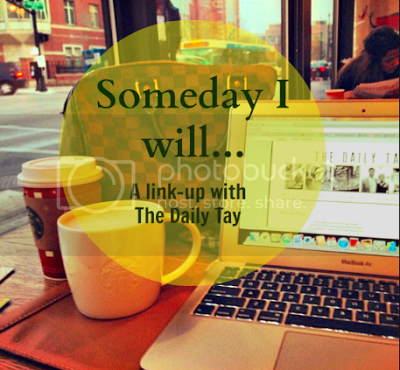 Today I'm getting all thought provoking and maybe even a little profound with Taylor over at The Daily Tay. Someday I will actually live within the city limits of my favorite city. Someday I will cook like my mom, just able to throw things together and it tastes yummy. Someday I will get my hair to do exactly what I want when it's curly. Someday I will exercise on a regular basis. Someday I will be completely organized. Our house, the blog, myself, everything! Someday I will visit more of Europe. I will visit Africa and Australia and so many other places. Someday I will just be happy with how things in my life are and how I am. Organization and exercise- two of my goals too! And definitely need to go easier on myself.